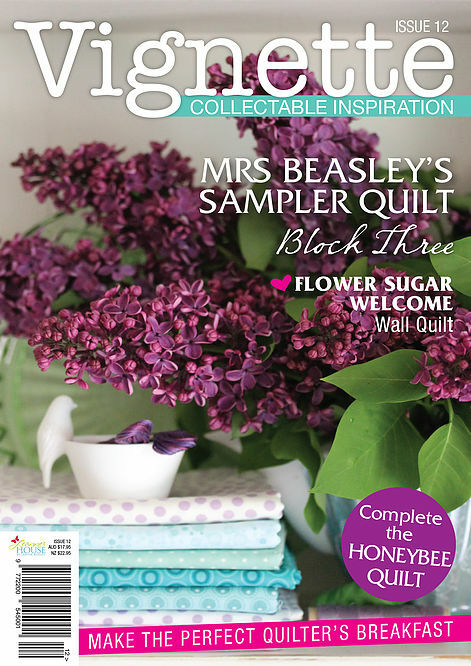 In Issue 12, enjoy creating Block Three in the four part Block of the Month Quilt, Mrs. Beasley’s Sampler Quilt. Stitch the Flower Sugar Welcome Wall Quilt, perfect to hang in the entrance to your home. Complete The Honeybee Quilt; including adding your own personal stitchery block. Sew together a beautiful Journal Cover, suitable for keeping your creative memories together. Lots more to discover in this issue including a quilter's ideal breakfast Bircher Muesli recipe, tips for your garden and a little armchair travel as well!